Zinus has nearly a dozen models in bed frames segment, however, in this review we are only going to cover the top two models which unilaterally own lions share in entire bed frames segment. If there is one bed frame on the market that someone could chose almost blindly then it is Zinus Elite SmartBase. Just take a quick look at its rating, number of reviews and the price. The rating in precise will surely drive your instinct to shortlist this bed frame from Zinus. Zinus Elite SmartBase is wholly made from solid steel and offers unmatched sturdiness. Although mentioned weight capacity stands at 500 lbs but the frame can support much more, almost up to 4000 lbs, drawn from user feedback. One another unique feature which is almost absent in all other bed frames are the parallel and horizontal steel slats. While most other bed frames limit to having just horizontal slats and few others include vertical slats as well but they are relatively thin. However, Zinus SmartBase Elite is the only bed frame that has both horizontal and vertical slats that are nearly 1 inch thick. Unlike regular 9 leg construction, Zinus has employed 12 leg construction. This design is wholly intended to offer additional stability. While there are 6 legs on the top and bottom sections, another 6 legs are focused completely in the middle section. Middle section is what absorbs maximum weight and having 6 middle legs adds to frames overall durability. It also eliminates annoying noise that typically emanates when bed frames absorb more than the preset weight limit. Whether a bed frame is foldable or not, it has no substantial impact on its sturdiness. However, the advantage with foldable bed frame is it is easy to store and takes relatively less space. And Zinus SmartBase Elite is foldable by design and lightweight as well, weighing mere 46.86 lbs. Thus it is easy to transport, move it from one room to another or from ground floor to top floors. 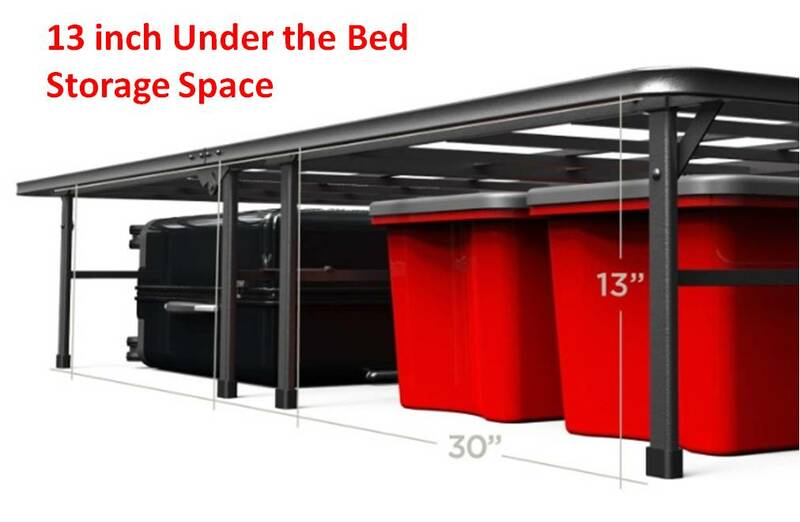 Zinus SmartBase is primarily designed to eliminate the need for additional box springs. It’s in fact termed as a replacement for box springs as it stands at a good height. However, if you still wish to have a box spring, the frame is compatible and works with box springs/foundations as well. The head section slats do not come with slots for attaching headboard. Yet, the same can be achieved using headboard brackets. Zinus SmartBase Elite is compatible with a wide range of mattresses. There is no need to have flatboards either as the frame surface has both vertical and horizontal steel slats covering pretty much all sleeping surface. This keeps the mattresses in good shape, both memory foam and Tempurpedic. Zinus SmartBase Elite is 14 inches tall and offers 13 inches of under the bed storage space. This is the same like all other 14 inch bed frames. Frankly, everything boils down to assembly process. First important factor being how sturdy the frame is and the second being how easy is it to assemble any frame. And Zinus bed frames are relatively much easier to assemble and less time consuming as well. It is a tool free assembly process and one person can comfortably put together all the units. Foldability feature also adds up to ease of use. Zinus Elite SmartBase comes with 5 years limited warranty. An investment on any product is always proportional to its durability. The longer the warranty period, the higher is the confidence of the manufacturer on their product. Hence, 5 years warranty itself speaks on the durability and performance of Zinus SmartBase bed frame. As mentioned in the introduction itself, Zinus SmartBase Elite has everything needed to affirm a bed frame as top choice. More importantly the customer satisfaction itself speaks volumes about its performance. 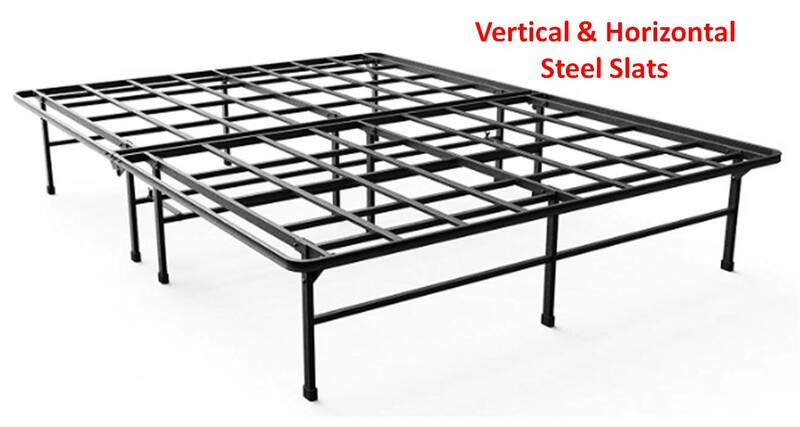 Almost all bed frames on the market right now come with full steel construction. But Modern Studio 1500 from Zinus is the only bed frame that comes with wooden slats and steel frame. There is an advantage behind employing wooden slats instead of regular steel slats. We’ll discuss the same in detail in next section that is focused on construction. But before that, let me highlight that even Modern Studio 1500 has gained decent rating with substantial number of reviews. While the main frame along with leg units are made of heavy duty steel, the sleeping surface has 10 wooden slats. 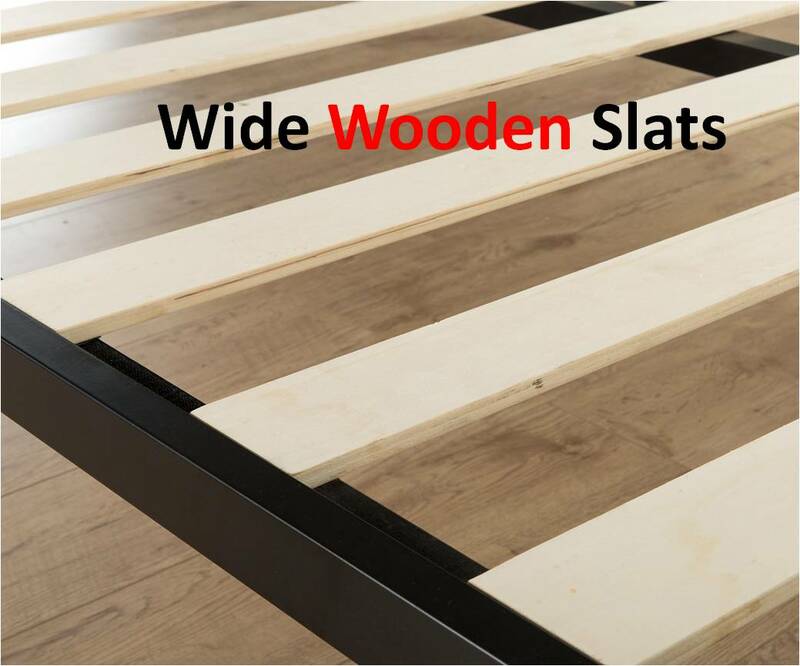 These wooden slats are much wider compared to traditional steel slats and effectively hold the mattress from sliding or slipping. These also remove the need to buy additional flat boards for bed frames, which otherwise are a must for memory foam and Tempurpedic mattresses. One notable feature is the number of legs. Zinus has rested the entire frame on just 5 legs, two on top, two at the bottom and one right in the middle. This is quite unique construction not employed in any another bed frame. The number of legs in this design do not have any impact on the overall capacity this Zinus Studio frame can sustain. It can comfortably support weights up to 2400 lbs which is again more than what two people can add up to. The reason why we can say that the number of legs do not have a direct impact on capacity is due to the flat slats. These wooden slats are quite wide, nearly 5 inches, and are more effective in absorbing and distributing weight evenly across the entire sleeping surface of the frame. The legs units are capped at the bottom and protect your floor from unwanted scratches. Zinus Modern Studio bed frame is not a foldable bed frame. And if you have plans to store it when not in use, then you have got to remove all units – the main frame, legs and wooden slats. It’s the same like assembly but takes less time. The design removes the need to have additional box springs. But if you still wish to use box springs, the frame does support but using a box spring along with this frame might increase the overall height. Two leg units come with slots so as to attach headboards. 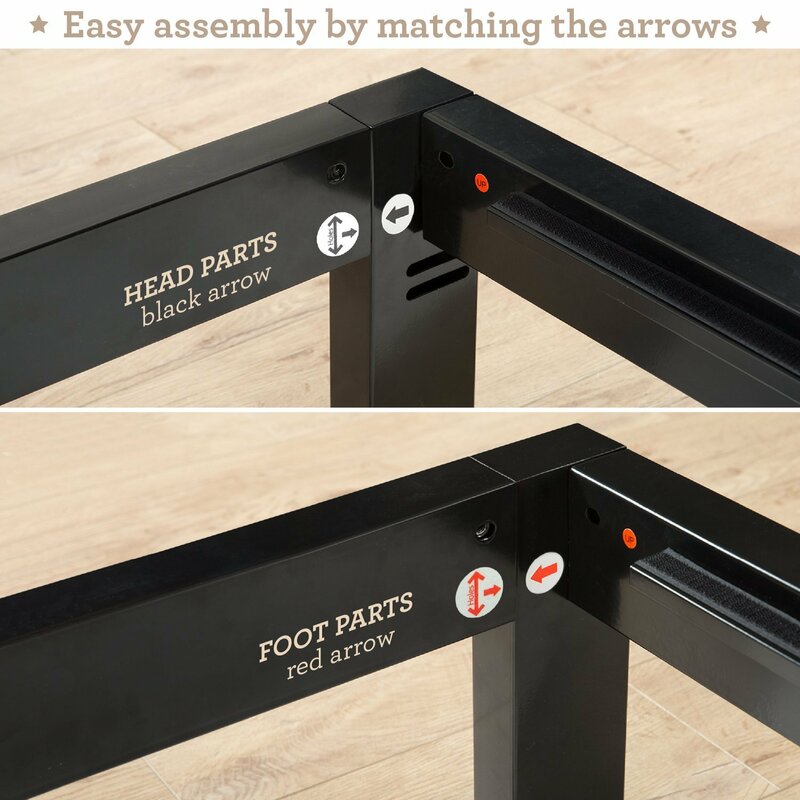 While assembling the bed frame, just check out for the leg units that have slots and fix them at head section. Zinus Modern Studio 1500 bed frame is compatible with all mattress types. Mattress compatibility is one major advantage with wooden slats. These flat wooden slats function pretty much similar to flat boards and there is no need to spend extra on buying flat boards, even for Tempurpedic mattresses. Modern Studio 1500 from Zinus too stands at height of 14 inches from the ground. 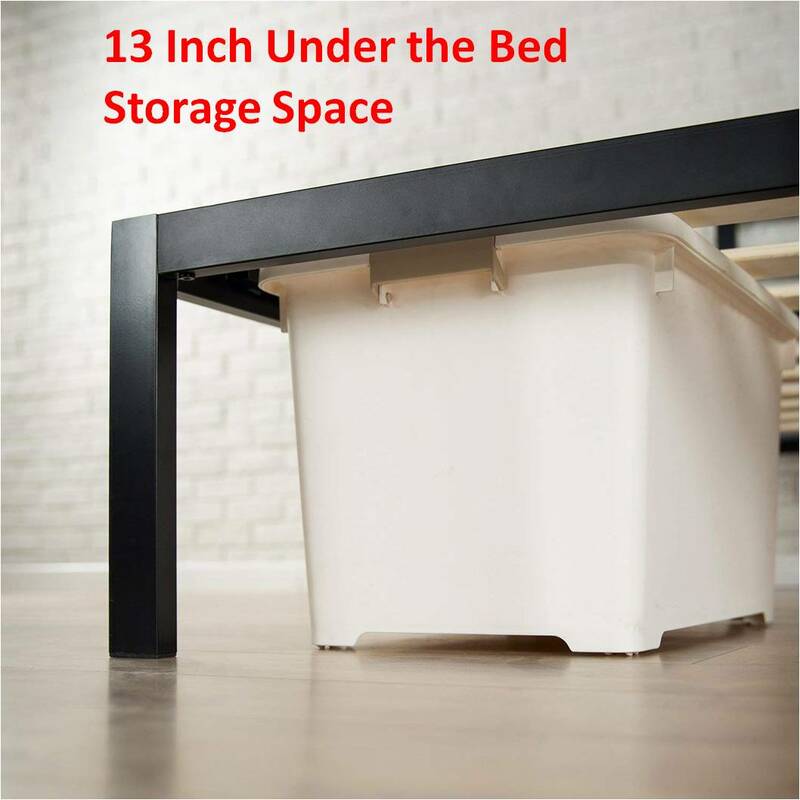 Although it offers the same 13 inches of under the bed storage area but there is one major advantage. Owing to simple 5 leg construction and no middle legs, there is plenty of room to place even large objects at both the top and bottom sections. Assembly process is the same like in every other bed frame. The only difference is fixing the 10 wooden slats to main frame instead of steel slats. But it is always advised to use heavy duty adhesive or threadlockers to screws so as to completely remove annoying noises which otherwise is a common problem with metal bed frames. Zinus has offered 5-Year limited warranty on its Modern Studio 1500 frame as well. 5 years is too long a period that rightly justifies your investment. 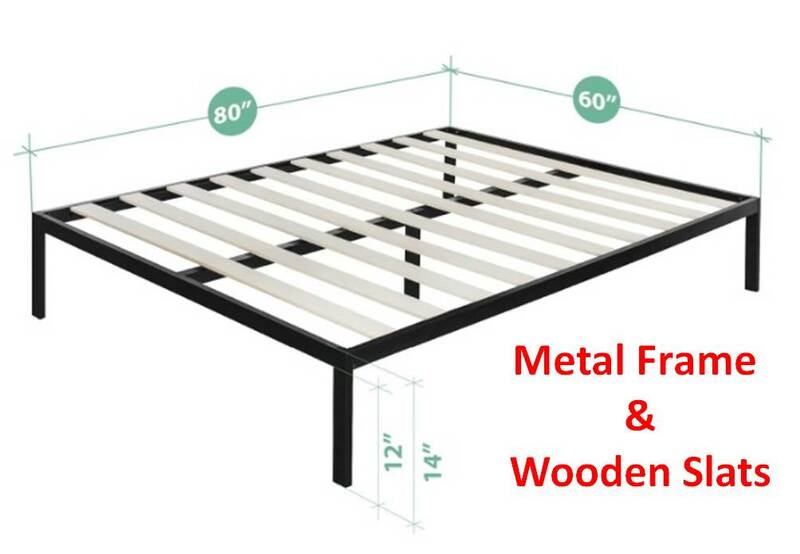 In case of bed frames with only horizontal metal slats, there is always a need to buy additional flat boards so as to protect mattresses, especially memory foam and Tempurpedic. And bed frames with wooden slats are anytime better option than steel slats. Not just that they are wide and distribute weight evenly across the sleeping surface but they add durability to any type of mattress.